Like the Hyundai i20 and the Honda Jazz, the Baleno is an all-new car. It bettered both in our comparison test earlier but can it continue to finish on top at a racetrack? Honestly, I anticipated the Baleno to do the same at Kari too, but it went on to exceed our expectations. The car feels the most connected when compared to the others and changes direction really well. The chassis stays planted and makes the driver feel a lot more confident about pushing the car harder around the track. The brake feel isn't as good as the Jazz but is good enough for track days. ABS is slightly intrusive, but it is possible to turn into corners without the system kicking in. This is something the i20 cannot do and is another reason why Hyundai is slower around Kari. The steering is like the Swift and amongst the best in a hatchback today. It complements the light and grippy chassis. The chassis itself is much lighter. 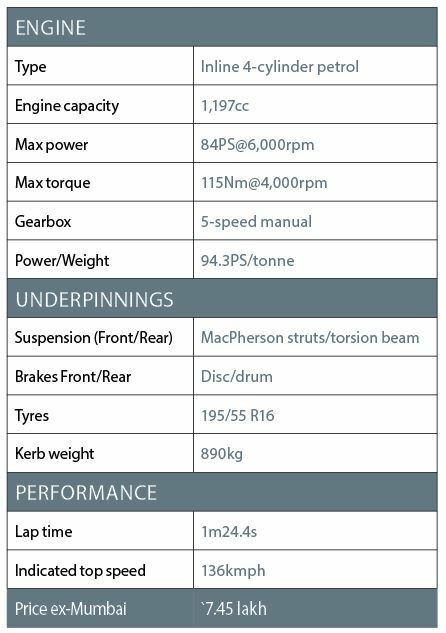 In fact, the Baleno diesel is almost 250kg lighter than the i20 diesel  that's the weight of four average-sized adults. Despite featuring the least powerful diesel engine on paper, the Baleno beats the Jazz diesel and i20's lap time around Kari. Things would have been a lot more interesting if it featured the more powerful 90PS engine. 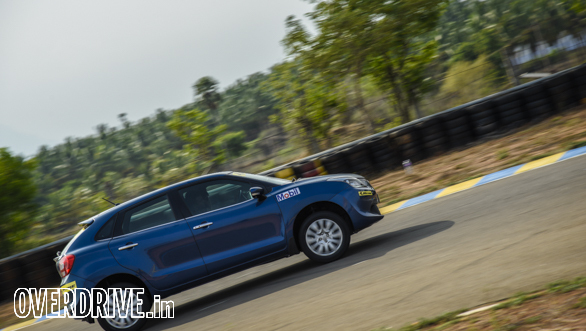 The petrol Baleno is the lightest hatchback here and also the quickest around the lap in this test when compared to its naturally aspirated petrol rivals. The gearbox has short throws that are also precise, making it a delight to use, especially on a racetrack. Aditya felt that the Baleno is the car that he'd happily drive around Kari all day long. It was also the choice for people driving for the first time on a racetrack. Rishabh was one of them and he managed to get within two seconds of Aditya's laptime. 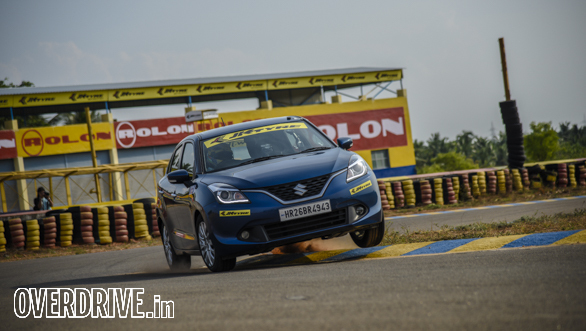 The Baleno is proof that a low kerb weight and a well-tuned chassis can make a car much quicker around a racetrack. Can't wait, then, for the more powerful Baleno BoosterJet to roll out in India. Bertrand D'souza: Another sweet car, and I'm slowly beginning to see how the new crop of Marutis or rather Suzukis with their European aspirations are beginning to appeal more to me. Yes, the suspension could do with some more tweaking and strengthening. 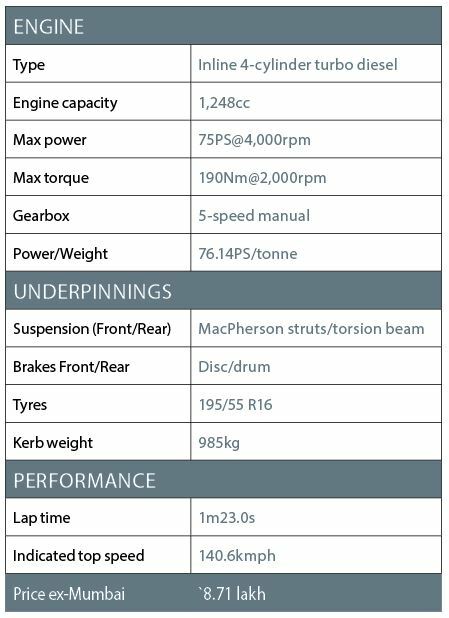 The engines could be more powerful, and the diesel is in a league above the petrol without a doubt. But I'm hoping the forthcoming BoosterJet takes care of some of these limitations this otherwise fun car has. Rishaad Mody: This one surprised. I didn't expect much from the Baleno, but it ended up being among the nicest to drive. The petrol engine is crisp and the happiest to rev. Even the plucky little 75PS diesel engine wasn't outclassed. The light chassis definitely helped, but small things like the seating position and steering feel contributed to this being one of the favourites all weekend. I loved the gearbox as well - short and precise throws in both the petrol and diesel.